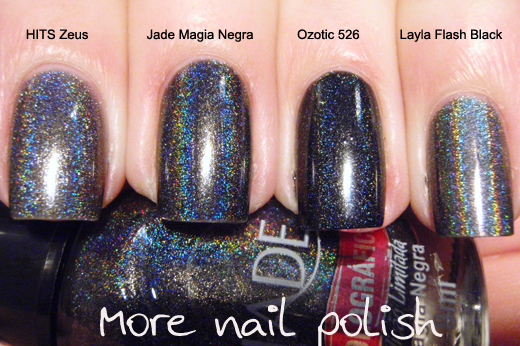 Jade Magia Negra is one of the amazing Jade holographic nail polishes I received from Rafa at Nails Ink in Brazil. It has fantastic coverage and is fully opaque at two coats. The wear time is excellent. I wore my mani for three days with zero sign of tip wear or chips. It truly is one of the blackest holos whilst still retaining spectacular rainbow fire. Quick dry top coat does not dull the effect. The goldish sheen showing in this photo is apparent in this polish, but not as pronounced as this photo, where it is exasibated by the bathroom lighting. On day two, I added some simple stamping from Bundle Monster plate 215. Stamped with China Glaze 2030. 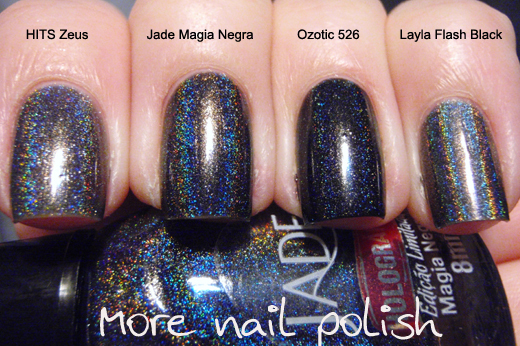 Finally, for you comparison needs, here is HITS Zeus, Jade Magia Negra, Ozotic 526 and Layla Flash Black all lined up for a comparison. Ozotic 526 is easily the blackest, but it's blackness also reduces its ability to let the holo shine through. Ozotic 526 really is a one coater, if it were a two coater maybe it would show its rainbow fire more. 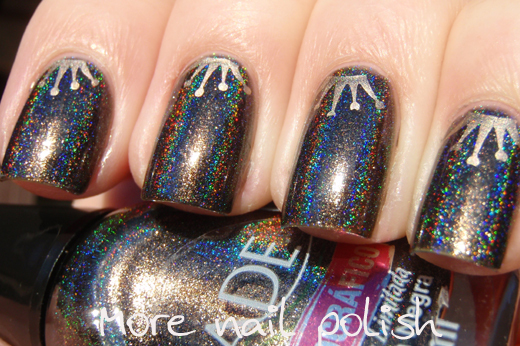 Hits Zeus and Layla Flash Black are both most definilty dark grey holos. 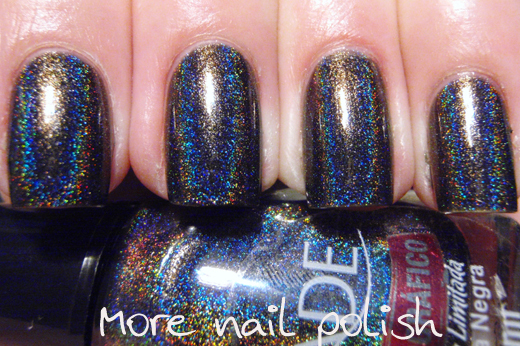 Jade Magia Negra - most definitely my new favourite black holo. Like I mentioned, I was gifted mine from a friend in Brazil, but you can get them online from Llarowe or Ninja Polish. Waaaaaaaaaannnnnt!! 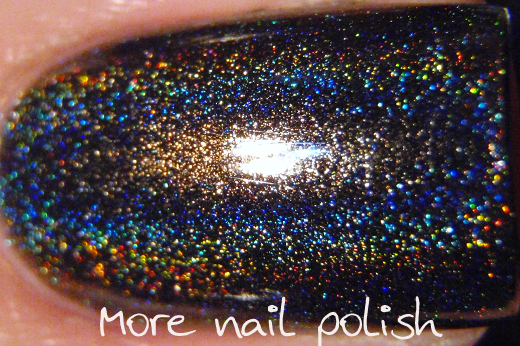 It's like the black holo of my dreams! That looks amazing. So striking! Gorgeous! 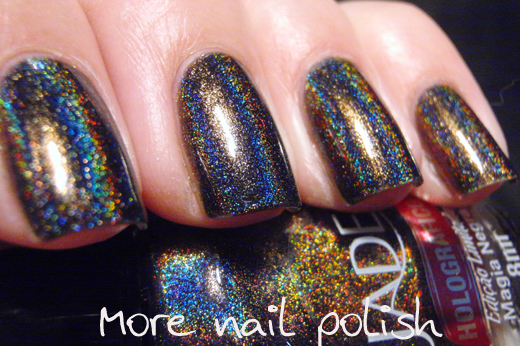 I need a black holo! It is gorgeous. I only have Color Club Revvvolution, and I'll have to get this one too. 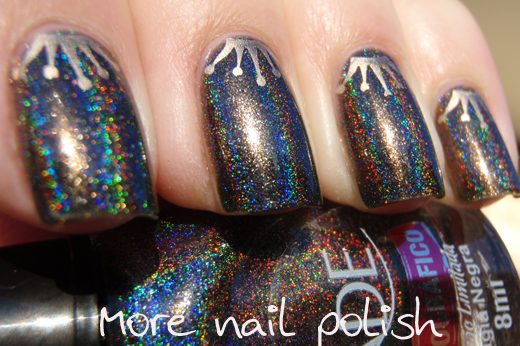 ordered this via llarowe and two weeks later, despite an answered call, no shipping confirmation email, no polish!